I am especially excited about this last How to Crochet lesson. Crochet corner to corner afghans look complex, but they are actually very easy to make. 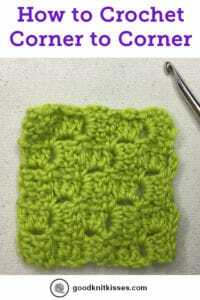 Using the basic stitches you’ve already learned you can make a square or rectangle in any size. From a washcloth or baby lovey to a large afghan the method is exactly the same so once you learn how to crochet a C2C you can make anything! Have you seen those gorgeous picture afghans (or graphghans, as they are often called) that follow a graph of colored squares? Those are made using the crochet corner to corner method. There are thousands of graphs available online for almost anything you could dream up. One of the issues you may run into is trying to figure out the finished size of a particular graphghan. I’ve got a handy C2C interactive crochet calculator that can help you with the math. The page is complete with swatching charts for both right and left handers and a video tutorial to show you how the calculators work. Let’s get started learning to crochet corner to corner! You will need to know how to make a double crochet stitch and slip stitch to make this stitch pattern. If you need to review go back and check out the basic stitches in this How to Crochet Series. Although it’s a square you crochet a C2C on the diagonal. A basic 5 x 5 C2C swatch teaches you all the techniques you need to make a full corner to corner afghan. In the video you’ll see me refer to the chart below. 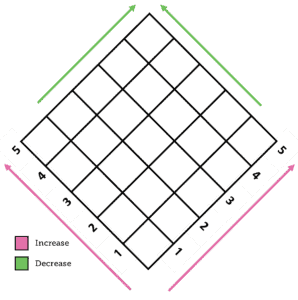 This is not a graphghan chart, but a teaching tool that show you the basic construction of a C2C square from your perspective. Start at the bottom with Row 1 and work each row back and forth. You’ll see Row 1 has 1 block, Row 2 has 2 blocks and so on. For the first half you increase at the beginning of every row until you have needed number of squares on the sides. (This is the halfway point and you can stop here for a fun triangular shawl!) To finish your square decrease at the beginning of every row until you reach the top corner. Row 1: Ch 6., dc in the 4th chain from the hook, dc in next 2 chains. Turn. Row 2: Ch 6, dc in the 4th chain from the hook, dc in next 2 chains. (Sl st, ch3, 3 dc) in next ch 3 space. Turn. Row 3 (increase row): Ch 6, dc in the 4th chain from the hook, dc in next 2 chains. *(Sl st, ch3, 3 dc) in next ch 3 space. * Repeat from * to * to end of row. Turn. Repeat this row until your square is the desired size. Row 4 (decrease row): Sl st in first 3 dc of previous row. (Ch 3, 3dc) in ch 3 space. *(Sl st, ch3, 3 dc) in next ch 3 space. * Repeat from * to * until there is one ch 3 space left. Sl st into last ch 3 space. Turn. Repeat this row until you have 3 blocks in your row. Row 5: Sl st in first 3 dc of previous row. (Ch 3, 3dc) in ch 3 space. (Sl st, ch3, 3 dc) in next ch 3 space. Sl st into last ch 3 space. Turn. Row 6: Sl st in first 3 dc of previous row. (Ch 3, 3dc) in ch 3 space. Sl st to last ch 3 space. 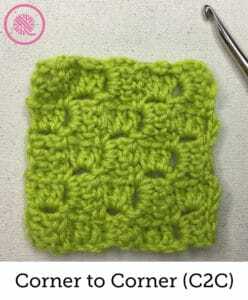 Watch the video below to learn how to crochet corner to corner (C2C)! 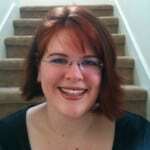 More importantly, I hope you’ve learned to love crochet so you can share your creativity with your family and friends. Be sure to share your creations on social media and tag with with #goodknitkisses. Also let me know if there are other crochet techniques you’d like to see from GoodKnit Kisses.